Following successful projects by Andrea Carlson and Aaron Dysart to illuminate the Upper Saint Anthony Falls Lock + Dam last year, Northern Lights.mn in partnership with Mississippi Park Connection and Mississippi National River and Recreation Area request proposals for a new Illuminate the Lock project to take place in September 2018. Entries are due April 24, 11:59 pm CST , 2018. Three finalists will receive $400 to create full proposals. The winning Illuminate the Lock proposal will receive a $16,000 budget for artist fees and production to execute the project. Illuminate the Lock is conceived as a way for an artist or artist team to utilize the unique infrastructure of the Lock, no longer used for river navigation, as a way to explore an aspect of the history, present, or future of the Saint Anthony Falls Heritage Zone, using the lock and falls as a “theater” for the story. The story can be about the Lock itself: in 2017 for Surface, Aaron Dysart painstakingly researched Lock Master log books of daily lockages from 1963 to 2015. 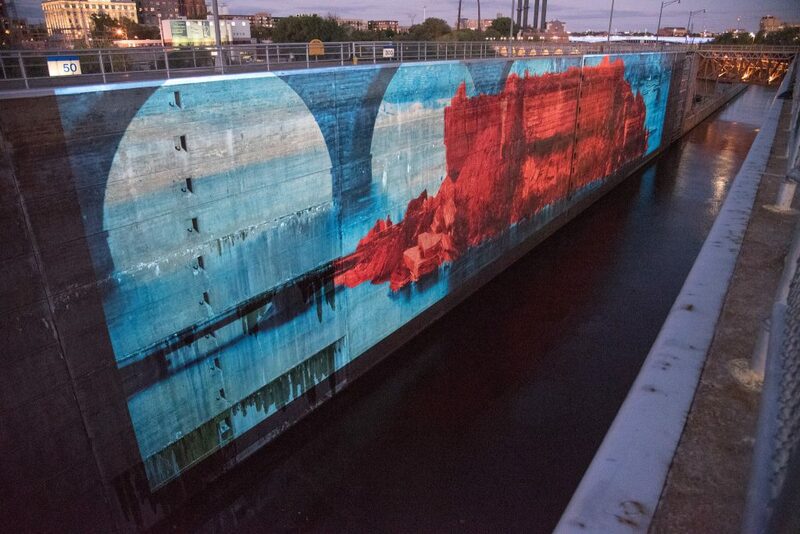 He then used this data to create a stunning light show of the historical record of navigation through the Saint Anthony Falls Lock. Or the story can be about a larger cultural history. For The Uncompromising Hand, Andrea Carlson researched the history of nearby but long-ago destroyed Spirit Island. Through a 400’ projection of historic photographs highlighted with drawings and annotated in English, Ojibwe and Dakota, she reclaimed the space as a Native sacred site, all the while teaching viewers about a part of Saint Anthony Falls area history that is largely unknown. 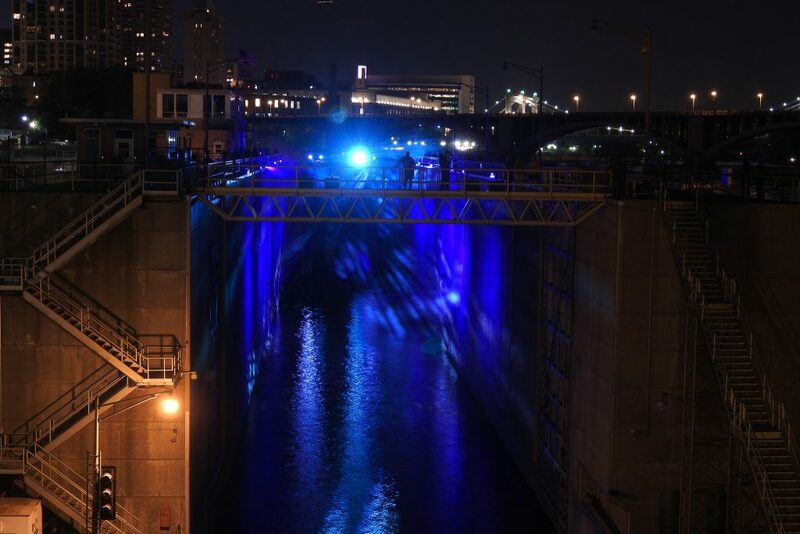 Illuminate the Lock is open to any artist or artist team. Artists must be available for periodic site review throughout the process as well as during the entirety of the presentation of the project. Dates: Projects must take place over 2 weekends September 14-15 and September 21-22. We will also consider projects that take place 3 or 4 consecutive days around either weekend. We advise emailing illuminatethelock@northern.lights.mn prior to the April 24 deadline, if you want to explore the consecutive days approach. Times: Our working assumption is that project will take place from around sunset (7:26 pm) until no later than 10 pm. We are open to other possibilities, but we advise emailing illuminatethelock@northern.lights.mn prior to the April 24 deadline, if you want to explore this. Entries are accepted online until 11:59 p.m. CST, Tuesday, April 24, 2018. A committee of stakeholders will select three finalists by April 30. Each finalist will receive a fee of $400 to prepare a final proposal. The same stakeholders will select the winner based on in-person presentations by the finalists on or around May 6. The commission fee for the selected project is $16,000. Click here to submit your proposal (beginning March 30). An optional informational session and tour of the Lock will be conducted on Saturday April, 21 at 1:00pm. Meet at Upper St. Anthony Falls Lock and Dam (1 Portland Ave, Minneapolis, MN). It is not mandatory to attend the info session and tour, but it is highly recommended. If you would like to get feedback about your proposal, please email illuminatethelock@northern.lights.mn with a draft of your proposal or your questions no later than April 21. 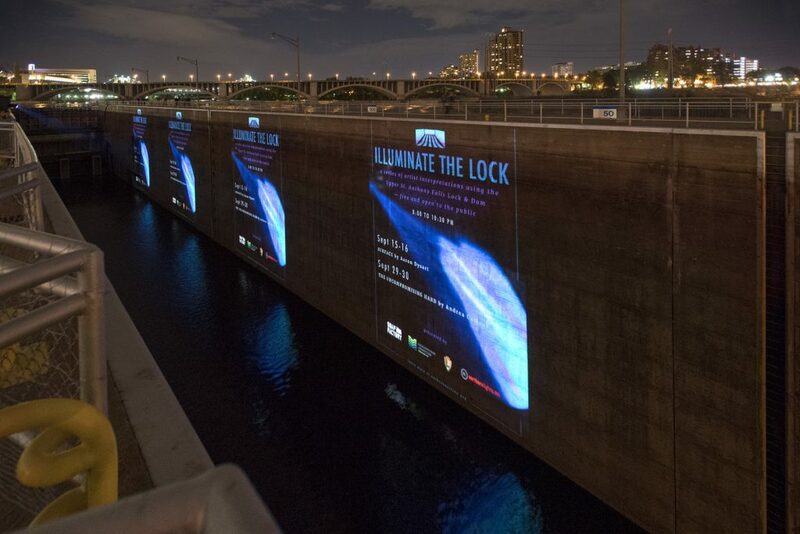 Illuminate the Lock challenges applicants to use the unique infrastructure of the Lock to create a compelling experience about an untold – or undertold – story about Saint Anthony Falls Heritage Area. These are the criteria we will be using to evaluate your proposal. Story. What is the story you are trying to tell and how/why is it untold or not widely known or not well-understood? Note that the “story” does not have to be a dramatic narrative. It can take many forms. Place. How does your proposal relate to the Lock and/or the St Anthony Falls Heritage Zone? For further information on interpretive themes designated by the Mississippi National River and Recreation Area, scroll to page 33 of this document. Artistic quality. The proposed work must be an original piece by the artist in any medium or multidisciplinary. It can be serious or funny, spectacular or intimate, or any combination thereof. Works that are commercialized or are intended to sell a product will be not be considered. We are not looking, in general, for common experiences like a fireworks display or a band playing a concert. Community/Audience Participation. Participation does not have to be direct, necessarily, or “interactive,” but we are interested in how you might reach out to and engage specific communities and/or the audience before, during or after the project. Nighttime. How will your project operate at night? If you are interested in proposing a daytime project, be sure to email illuminatethelock@northern.lights.mn before the April 23 deadline. Safety. Please consider the safety of yourself, your audience and the artwork. Crowded. The first Illuminate the Lock was very popular, drawing hundreds of people each night. How will many people experience your project at once? Feasibility. Your project must be feasible to run over the course of 4 nights, potentially on 2 weekends. Describe how your project is feasible to set up and take down within a reasonable timeframe and does not hinder regular visitation of the lock, when it is not being presented. Lock open hours in September are 9 am – 5:30 pm on weekend days. Durability. Any installed elements must be durable, able to withstand wind, rain, sun, and active use of the facilities. The Project must be easily maintained. We will assist and facilitate permitting, electricity, permissions, and other aspects of the project, but artists are responsible for the creation, production, execution and maintenance of their project, including all necessary permitting, and restoration of the site afterward. Legal. Projects must meet all necessary city laws, ordinances, and codes. Extensive research about city codes is not necessary for the application. Staff will help with these questions after projects are selected if necessary. The commission for Illuminate the Lock is $16,000. A design fee of $400 will be provided to 3 finalists. Budgets should include everything necessary to present the project from construction to permits to installation/deinstallation to artist fees. Proposals are due by 11:59 pm CST on Tuesday, April 24, 2018. Supporting materials that help us understand better your proposal and that it is feasible. This can range from a sketch on a napkin to CAD drawings, from a photo with a drawing superimposed to a video flythrough. If there is a technical component to the project, make sure to explain it. To the extent possible, give us a sense of the size and footprint of the project. Email illuminatethelock@northern.lights.mn with additional questions. Mississippi Park Connection is the charitable, nonprofit partner of the Mississippi National River and Recreation Area. Its mission is to strengthen the enduring connection between people and the Mississippi River by enriching the life of the river and the lives of all who experience our national park, the Mississippi National River and Recreation Area. In 1988, a National Park was created in the Twin Cities to preserve, protect and enhance the significant values of the waters and land of the Mississippi River corridor within the Twin Cities metropolitan area. Known as the Mississippi National River and Recreation Area, the park extends for more than 70 miles along the river, running directly through the metropolitan area (the park corridor begins in Ramsey and Dayton and ends just south of Hastings). The park provides leadership, acting as a facilitator and coordinator, in promoting a common vision for river corridor management among 25 municipalities and numerous partner agencies and organizations, whose responsibilities intersect. Illuminate the Lock 2 is supported with a grant from the Saint Anthony Heritage board and the cooperation of the U.S. Army Corps of Engineers.